Nottingham Forest have completed the signing of USA striker Robbie Findley, subject to securing a work permit. Findley, 25, is a free agent after leaving Real Salt Lake in the MLS and had been on trial with Premier League side Wolves. The forward has been capped 11 times by his country and played against England in this year's World Cup. 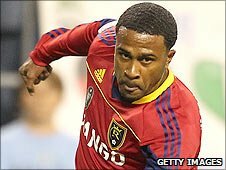 Findley began his MLS career with LA Galaxy, but went on to score 28 goals in 91 appearances for Real Salt Lake.